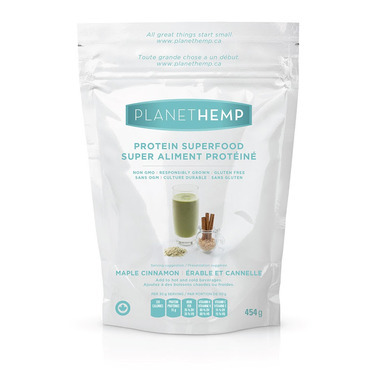 Planet Hemp Protein Superfood provides you with an excellent plant based protein along with the added benefits of alfalfa. 2/3 edestin protein similar to that of the human body, 1/3 albumin protein the same as egg protein, provides a perfect balance of essential Omega 3 and 6 polyunsaturated fatty acids, source of fibre, contains many essential vitamins and minerals. 15 g of protein. an excellent source of Iron with 35% of daily recommended value, an excellent source of Vitamin K with 60% of daily recommended value, an excellent source of Vitamin C with 15% of daily recommended value. Add to hot and cold beverages. Hemp protein powder (68%), organic alfalfa powder, organic maple sugar, organic cinnamon.